A Rinkya Blog: 3D TV- Only in Japan! Hyundai has released a television that allows you to watch 3-D programs. Japan only has a few 3D programs available on cable, but is hoping the trend will catch on. The LCD TV is 46 inches & costs much more than the regular LCDs, coming in just under $4000. It comes with two pairs of 3D glasses. While programming is currently very limited, regular TV programming is given an illusion of depth when you watch on the screen with your glasses. Hyundai does not have plans to release the TV anywhere but Japan, but maybe if it is a successful run, we will see the demand elsewhere! Actually, Japan is behind the curve on this one. At the Coimbatore airport in India they already have 3D TV -- and you don't need glasses. No kidding. Absolute 3D Visions is the company to launch glasses free 3D digital signage in Coimbatore Airport. 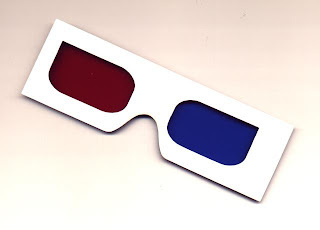 This technology of viewing 3D without any special glasses is "Autostereoscopic 3D" display technology.